Always in demand! Birthday cards! Hope you are enjoying the weekend. This is a long weekend for me. Enjoying a relaxed Saturday gardening. 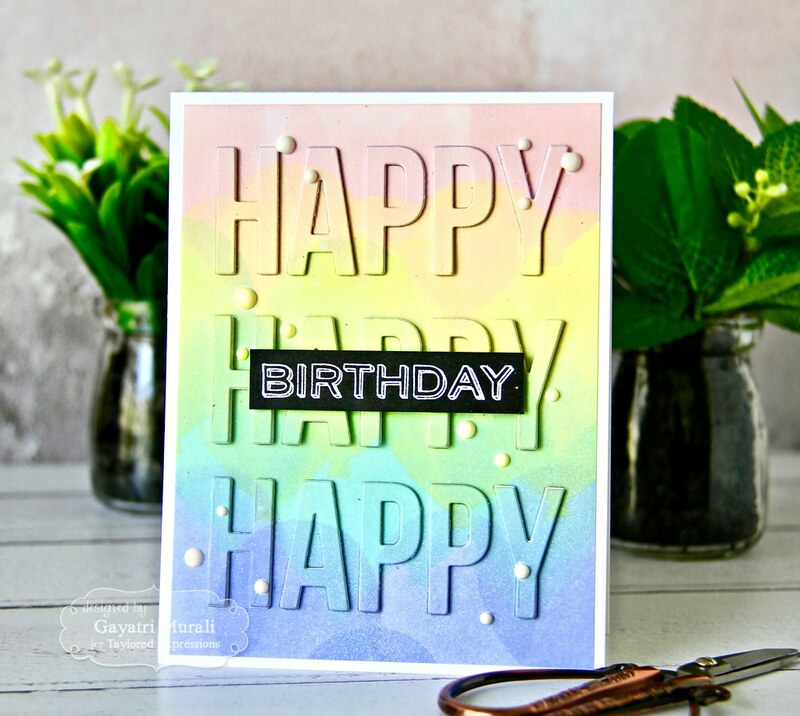 I also made couple of birthday cards using Taylored Expressions mini birthday release products. Birthday cards are always in demand in my house. So the more I made the better. 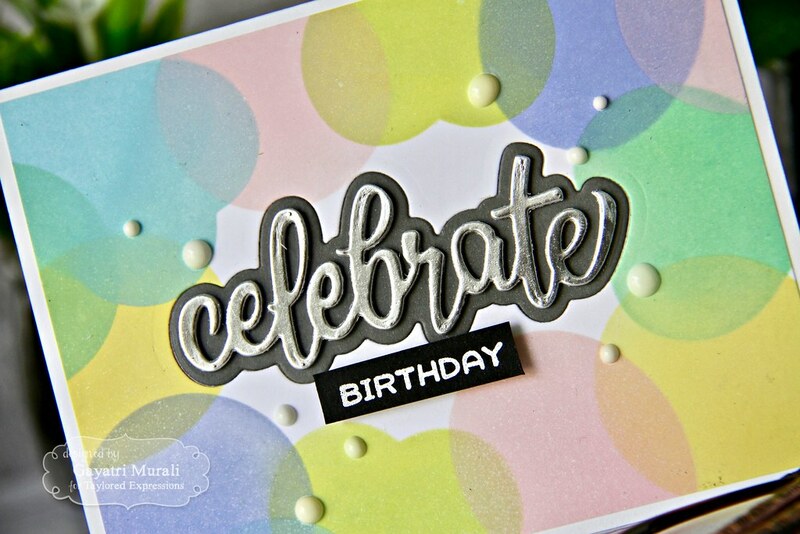 When I saw the gorgeous balloon stencil from Taylored Expressions and their new Happy and Celebrate dies, I wanted make couple of cards to add to my depleting stash. 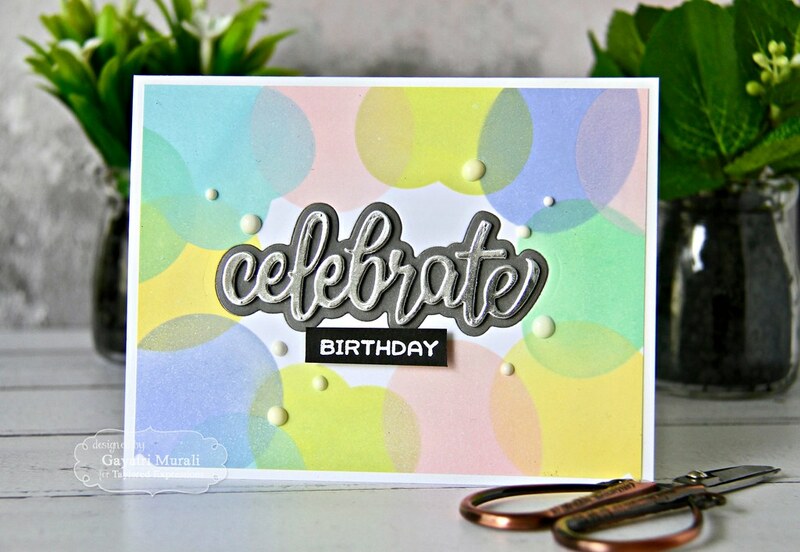 I used the Big Bold Balloons stencil from TE and distress oxide inks to sponge balloons all over the panel to created a layered balloon background. I used Milled Lavender, Cracked Pistachio,Twisted Citron, Squeezed Lemonade and Spun Sugar distress oxide inks. Once dry, I used the Caps Lock HAPPY die to die cut the panel three times. 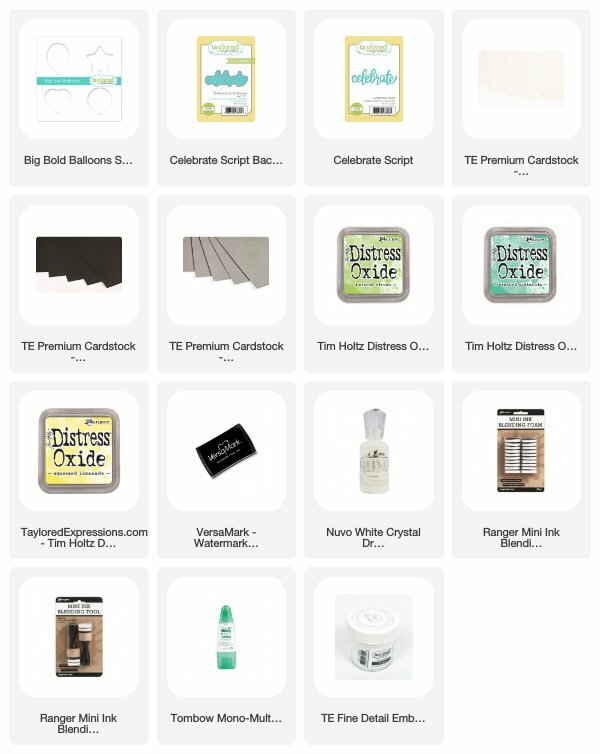 I also die cut eleven more HAPPY using white cardstock. I stacked and glued two sets of three for the top happy and bottom happy and one five stack for the centre happy. I trimmed the negative balloon sponged panel on a Sugar Cube card base. Then adhered the three stacked Happy sentiment in the top and bottom negative space on the panel on the card front. Then glued the postive happy diecuts on the top of the stacked inlaid diecuts. Similarly I glued back the five stack happy die in the centre of the negative panel with the postive die cut glued on top of it. Hence making eclipse sentiment card. Then I white heat embossed the birthday sentiment from Caps Lock Companion Happy Occasions stamp set on a strip of the Oreo cardstock and adhered on top of the centre Happy on the card front. Finally some Nuvo white crystal drops to finish off the card. 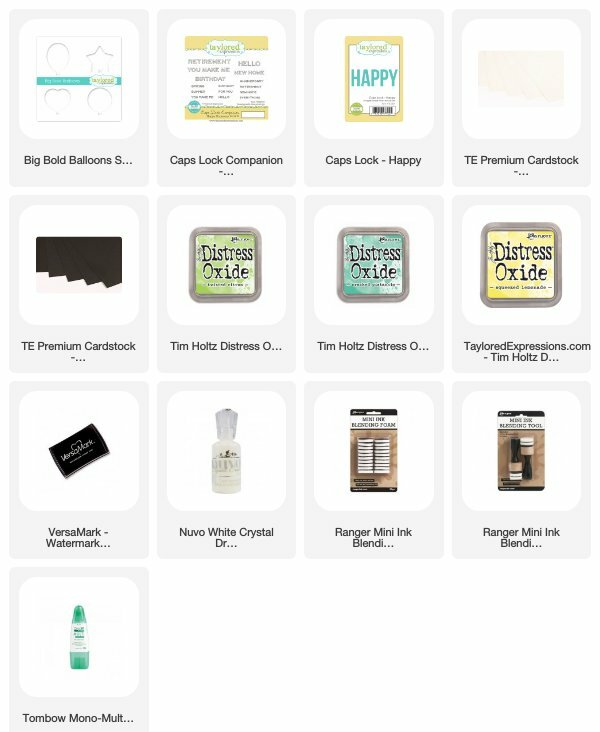 The supplies used to make this card are listed below. For card #2, I sponged the balloons using the Big Bold Balloons around the edges of a Sugar Cube panel. For the sentiment, I die cut the Celebrate Script Backer die using Earl Grey cardstock. 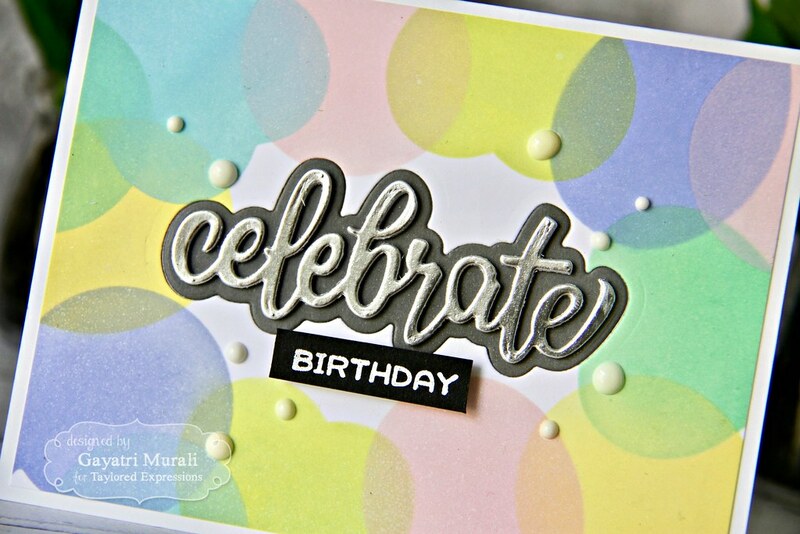 The Celebrate Script die, I die cut using TE silver foil cardstock and adhered on top of the backer die cut. Then I used the Celebrate Script Backer die to die cut right in the middle of the ballon sponged panel. I then trimmed the panel to 4″ x 5.25″ in size and adhered to a Sugar Cube card base. I then inlaid the sentiment created back into negative space on the background panel. 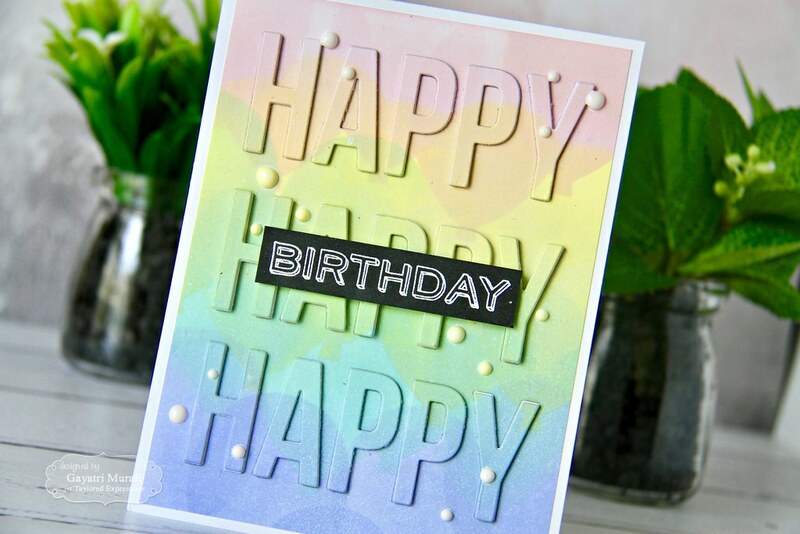 The secondary sentiment from Caps Lock Happy Occasions stamp set is white heat embossed on to a strip of Oreo cardstock and adhered below the primary sentiment using foam adhesive. Finally, some white Nuvo white crystal drops scattered around the sentiment. 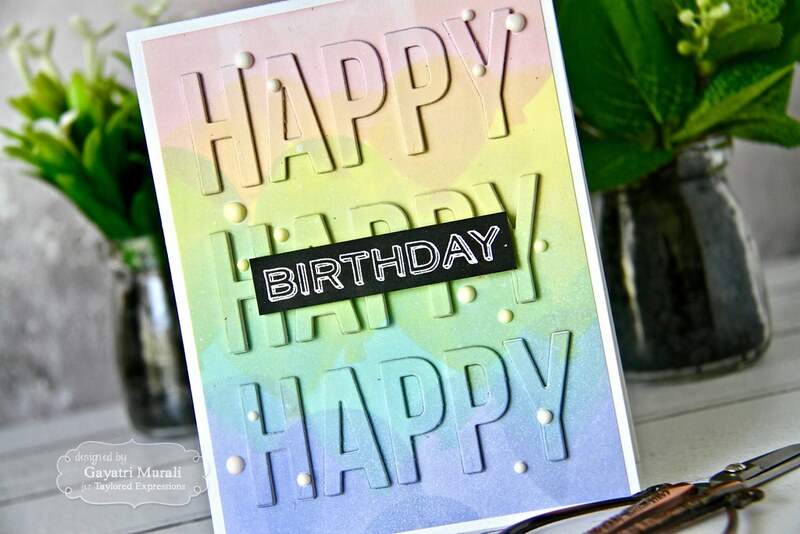 I love the use of pastel colours on my card. This is outside my comfort zone. The colours look so pretty. Don’t you think? Hope you are inspired. Thanks for stopping by my blog this weekend.